In this post, we'll explore Apache Ignite and its new native persistence feature and provide a clear picture of how Apache Ignite native persistence works. In-memory approaches can achieve blazing speed by putting the working set of data into the system memory. When all data is kept in memory, the need to deal with issues arising from the use of traditional spinning disks disappears. This means, for instance, there is no need to maintain additional cache copies of data and manage synchronization between them. But there is also a downside to this approach because the data is in memory only, it will not survive if the whole cluster gets terminated. Therefore, these types of data stores are not considered persistant at all. In this blog post, I will explore Apache Ignite and its new native persistence feature and provide a clear, understandable picture of how Apache Ignite native persistence works. Permanent media, to store committed transactions, thereby maintaining durability and for recovery purpose if the in-memory database needs to be reloaded into the memory. Permanent storage, to hold a backup copy of the entire in-memory database. Permanent storage or media can be any distributed or local file system, SAN, NoSQL database, or even RDBMS like Postgres or Oracle. Apache Ignite (since 1.5) provides an elegant way to connect persistence data stores such as RDBMS or NoSQL DB like Mongo DB or Cassandra. Most often persistence in an RDBMS will be bottlenecks and you never got a horizontal scaling in your system. An updated version of the Ignite Native persistence is described in "The Apache Ignite book". Please see the sample chapter of the book for more information. There is a special 20% discount for the DZone readers, please use the following coupon. So, from the version 2.1.0, Apache Ignite provides ACID and SQL-compliant disk stores that transparently integrate with Ignite's durable memory as an optional disk layer storing data and indexes on SSD, Flash, 3D XPoint, and other types of non-volatile storage systems. 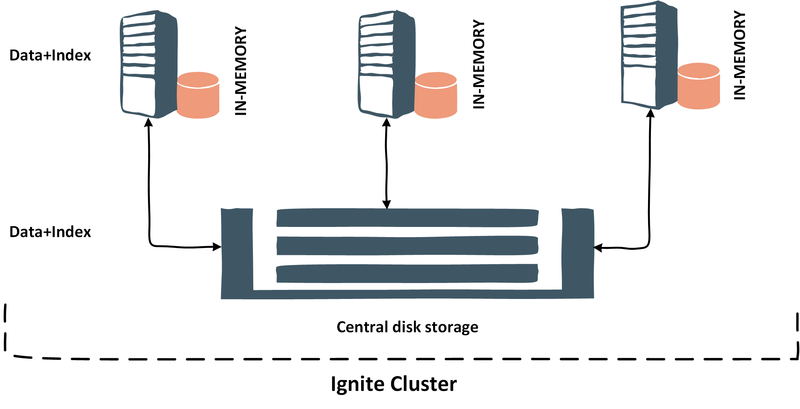 The Apache Ignite native persistence uses new durable memory architecture that allows storing and processing data and indexes both in-memory and on disk. Whenever the feature enables, Apache Ignite stores a superset of data on disk, and a subset of data in RAM based on its capacity. If a subset of data or an index is missing in RAM, the Durable Memory will take it from the disk as shown new pictures below. Data can be also stored in the central disk storage where all the Ignite nodes are connected as shown below. Download the binary distribution and unzip the archive somewhere in your OS and run the ./ignite.sh bash script with the spring config files. Create a Maven project with the required Apache Ignite dependencies, configure the node through the Java code and run it. Here, I am going to use the first option. Download the Apache Ignite binary distribution and unzip the distribution somewhere in your sandbox. Modify the IGNITE_HOME/examples/config/persistentstore/example-persistent-store.xml file and comment the following part of the cache configuration. Note that to enable the Ignite native persistence, you only need to pass the following configuration (an instance of the PersistentStoreConfiguration), which was already pre-configured in the example-persistent-store.xml file. Run the following command from the IGNITE_HOME directory. Create a Maven project with the following command. Create a Java class with the following contents. Note that we are using Ignite client mode for manipulating data. 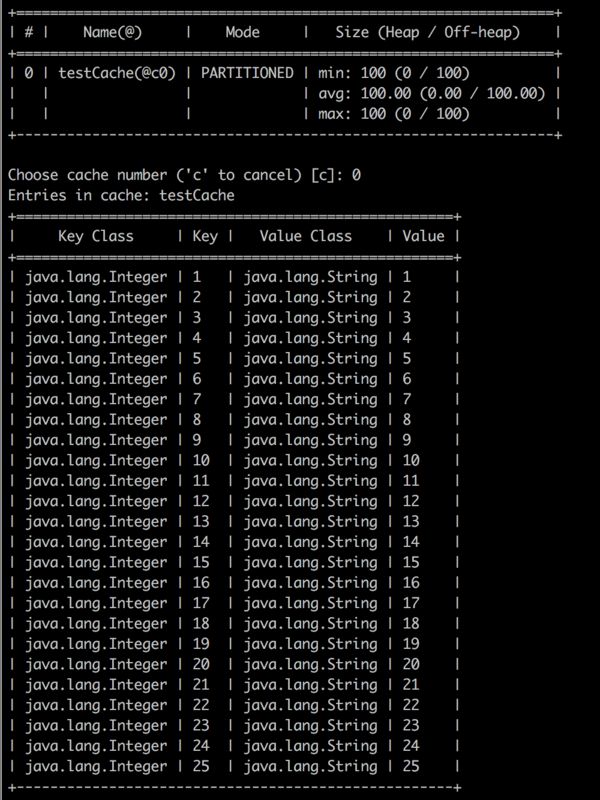 After running the HelloWorld application, 100 elements should be inserted in the cache (cache name testCache). If Apache Ignite native persistence enables, Ignite will persist all the data and the index in memory and on disk across all the cluster nodes. If you will go through the directory db/0_0_0_0_0_0_0_1_10_211_55_2_10_37_129_2_127_0_0_1_192_168_1_37_47500 (in my case), you will find individual folder for every cache. 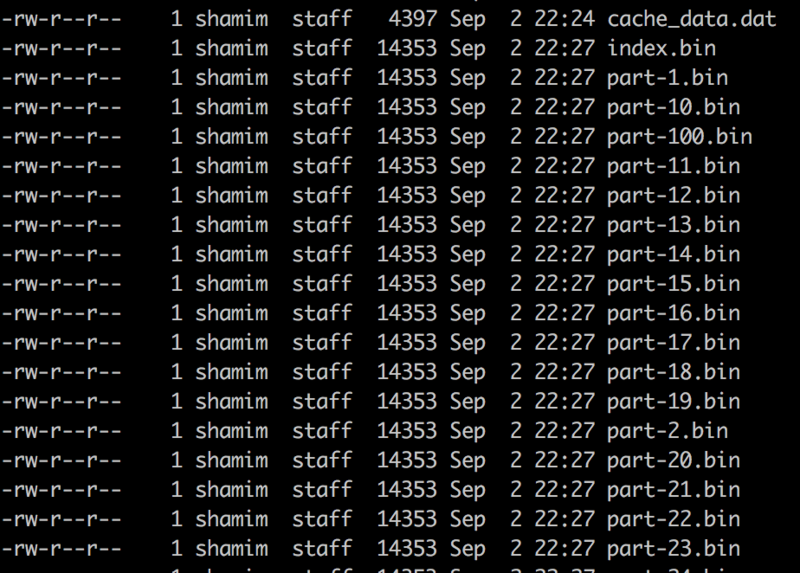 The folder with name cache-testCache will contain all the cache entries (100 elements) which we have just inserted. A page is a fixed-length block, it also supports automatic defragmentation. If you take a closer look at the pages size, all of them are 14 KB. Whenever Ignite needs to load data from the disk, it just loads the page file and so it's very fast. Also, there is another concept over the write-ahead log (WAL). If you are doing an update, first it will update the data in-memory and marks the page dirty, and then it will persist the data into the write-ahead log. Ignite just appends the update into the WAL file. A WAL file is very similar to a Cassandra commitlog file, with one difference. Cassandra writes parallel into in-memory and the commitlog file on disk, on the other hand, updates the data into the memory first and then appends the data into the WAL. For more information, I recommend you to have a look at the documentation, which is quite exhaustive. Restart the Ignite node, and check the cache testCache with ignitevisor. You will end up with a surprise that there is no data in the cache. 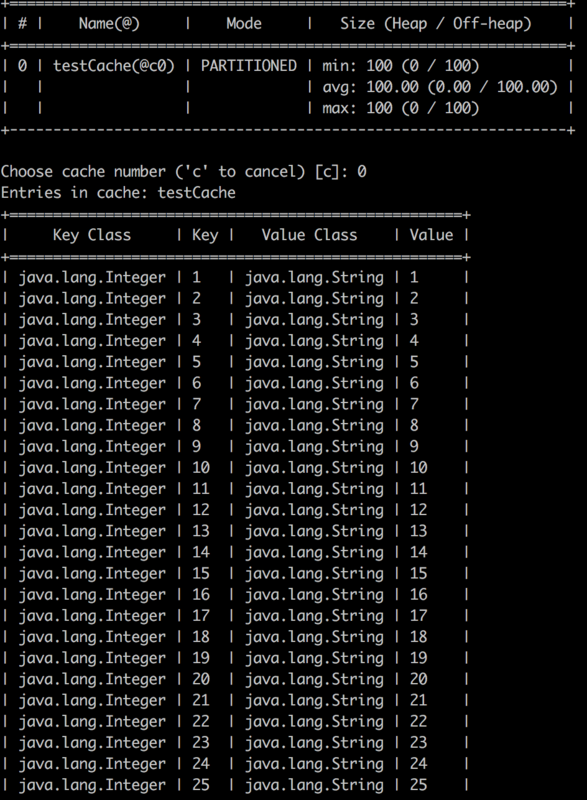 Run the application and check the cache testCache through ignitevisor and your application console. Whenever any read request occurs, Ignite first checks the data into the memory. If the dataset doesn't exist in memory, Ignite immediately loads the cache entries from the disk and loads into the memory. Also, note that all entries into the memory are in offheap. With Ignite native persistence, now you can easily perform backups for the data recovery. Denis Magda wrote a comprehensive article on data recovery by using Ignite native persistence. One thing I have to mention here is the data replication between clusters. By using Ignite native persistence, now you can replicate data from one cluster to another on line. You can use any standard disk based data replication tools to copy the changed data set from the primary data center to the stand-in data center or Ignite cluster. If you want to learn more about Apache Ignite (persistence in RDBMS/NoSQL), check out my book. Published at DZone with permission of Shamim Bhuiyan . See the original article here.